Everything you need to know about the Jyrgalan trek, the newest adventure destination in Kyrgyzstan! For decades intrepid hikers from around the world would flock to destinations like the Himalaya, the Alps and Patagonia to experience the beauty that is being deep in the mountains. Unchartered territories and the thrill of solitude proved to be too attractive for many explorers to ignore. Trekking was more than just something to do – it was a way of life. In recent years these hiking hotspots have been inundated with thousands of tourists, who are also finding themselves drawn to life in the mountains. Those that wanted to get off the beaten path would have to search deeper, further and longer to find the untouched environments that are scattered around our planet. Since the fall of the Soviet Union one country has been gathering traction as one of the best and most unique trekking destinations around. Tucked away in the heart of Central Asia, where ancient trade routes and conquerors crossed paths over millennia, Kyrgyzstan is a true paradise that is just being rediscovered. With 93% of the landlocked nation covered in mountains, some of them reaching over 7000m above sea level, it is easy to see why Kyrgyzstan’s adventure tourism market is growing exponentially every year. The affordable cost of living and visa-free travel for most nationalities, along with the stable security situation, has resulted in more and more people flocking to the jewel of Central Asia. While most tourists are fascinated with the curious history and welcoming culture that can be found there, expertly showcased in the bi-annual World Nomad Games, it is the outdoor activities that captivates the majority. Mountain biking, rafting, fishing, horse riding and trekking offer a small taste of the wonders waiting to be tackled amongst the peaks. Some areas like Altyn Arashan and Ala Archa are about as popular as it gets for a country already off the beaten path, but a new region has just been put on the map that is waiting to be explored. Located a short distance from the bustling town of Karakol in Eastern Kyrgyzstan, the Jyrgalan Valley has recently opened up to tourism. Overshadowed by the immense lake Issyk Kul and other its diverse landscapes, Jyrgalan is now under development. The potential for adventure in Jyrgalan is unrivalled – world class trekking and skiing in the middle of the Tian Shan mountain range is all accessed from the quaint village in the heart of the valley. As the years pass no doubt more activities will be added to the potential list of things to do in Jyrgalan. UPDATE – We just returned from Jyrgalan again, where this time we were the first people to every hike along a new trail. We marked and mapped out the Keskenkija Loop Trek, and this 64km, 4-day hike is guaranteed to blow minds! We travelled to Kyrgyzstan again earlier this year to check out the World Nomad Games, but before we moved towards this cultural extravaganza we couldn’t resist spending some more time in the mountains. We started our latest journey to Kyrgyzstan in Bishkek, which is still to this day one of our favourite Asian cities. It was just a quick stopover though, as we teamed up with our fellow trekkers and friends Dan and Audrey from Uncornered Market and made the long drive out towards Jyrgalan. Our goal was to tackle a new 58km trek that had only just been developed. It takes a long time to get anywhere in Kyrgyzstan, and after a brief stopover for lunch and to pick up supplies in Karakol, we finally made it to the village 12 hours after we left the capital city. Night had well and truly set in when we arrived at the Alakol Jyrgalan Guesthouse. Our group was accompanied by Tynch, the executive director of Destination Jyrgalan, and Kyle, a USAID consultant. Despite working hard in the area, it was their first time into the mountains as well and excitement was high. Alakol Jyrgalan Guesthouse was among some of the nicest family-run accommodations we had ever come across in Central Asia. For only $20 per person we were given a private room, hot showers, wifi (albeit slow), a delicious dinner and breakfast. Run by the affable Emil and his wife Gulmira, they are helping to push the standards of accommodation in Jyrgalan to new heights while boosting tourism. Emil and Gulmira from the Alakol Jyrgalan Guesthouse. After a delicious breakfast we could finally catch a glimpse of the Jyrgalan village that had been covered by nightfall when we arrived. Unpaved roads twisted their way between animal yards and mixed material houses. Horses and cows wandered freely against a stunning backdrop of rolling hills. It was simply glorious. An old truck in the Jyrgalan village. Looking back on the village. Our plan was to trek 58km from Jyrgalan village at 2260m above sea level, over the mountains (peaking at 3515m) and finish up in Boz Uchuk 3 days later. Besides our group of trekkers we also had a lead guide Sacha, an assistant guide who was under training, Murat and Nazira, a lovely couple who were working as cooks, and two horsemen Azamat and Jenish who would help transport our equipment. We set out into the wilderness, leaving the village behind. The beginning of the Jyrgalan trek, officially known as the Boz Uchuk Trek, took us through pastures filled with sheep and cows grazing under the watchful eye of the shepherds. It didn’t take long before soon even they were gone, and we were completely on our own. The pace was steady and we chatted away while crossing rivers and passing beneath towering summits. We stayed beneath the treeline for much of the first day. Just before lunch we took a 5km detour up to a small lake. The trek uphill was steep and arduous, but the reward was well worth the effort. The last few hours had us following a glacial river. The water was crystal clear and the steady sound of a flowing creek tumbling over rocks became the soundtrack to our hike. Eventually we reached the location of our first campsite. We all pitched in to set up the tents, and before too long Murat and Nazira were cooking up a delicious feast in our dining tent. Dan cracked open a bottle of whiskey and we chatted away beneath the open sky. As soon as night came the temperature plummeted. Tired and cold, we all retired early, wrapping ourselves in every piece of clothing we owned. Following the river towards our first campsite. The second morning brought frost. It had been a shivering night for everyone in our party as the mercury dropped below freezing. By the time we had managed to crawl out of our tents Murat and Nazira were already brewing piping hot cups of chai for us. We couldn’t be more thankful! We prolonged packing up our tents as long as possible (because there’s few things we enjoy less than packing a tent covered in ice with no gloves) and hit the trail as soon as we were ready. Murat and Nazira tirelessly working to keep our stomachs full and bodies warm with chai. The second day would prove to be the most tiring, tackling two mountain passes over 17km. And it all started with an immediate ascent to the top of the highest pass, Terim Tor Bulak at 3467m. The weather was much better this day, and as soon as we exited the shadows cast from the mountains our bodies warmed up and we were shedding layers. Step after step we trudged on the side of Terim Tor Bulak Pass, panting as we gained altitude. As it always is with things like this though, the moment we caught sight of the snow-capped peaks on the other side it was completely worth it. Our group taking a rest break at the top of the pass. After a brief rest stop it was time to push on deeper into the mountains. The descent was even steeper than the ascent, and we gingerly crept down towards flatter ground. Grass made way for shrubs, and soon we hit the Tiorgei Ak-Suu River. The colour was unreal, fed from springs and snowmelt far in the distance, collecting minerals as it went. We crossed the dilapidated bridge and naturally had to stop for a few more photos. Onwards and upwards, we followed a makeshift trail to our second pass. This side of the valley was quite different, with a river spilling down from an unseen source. We stopped for lunch, stocked up on energy and headed off for the final stretch to another lake. A great spread of food put on by our wonderful cooks Murat and Nazira. Despite having lived and worked in the Jyrgalan area for years, Sacha had never actually been to this second lake. Curiosity had gotten the better of him and he was determined to find out what was feeding the river. We were all too eager to join him, and aimed for a distant bowl surrounded by jagged peaks. The lake, naturally, was spectacular, and once we had snapped our shots we started to make our way towards our second campsite for the night. Surrounded by cows we pitched our tents and resumed our usual positions of drinking chai and conversing. I had an amazing chat with Azamat and Jenish about life in the mountains, their families and hunting. They didn’t speak English, and I know no Russian or Kyrgyz, but miming, drawing and pictures on their mobile phones helped the conversation stay fluid. Dinner was delicious, expectedly, and we headed off to bed just after sunset. Setting up our tent while cows watch on. The second night was not as cold, which meant we all got a better sleep. This proved to be a blessing, because we had decided to climb up to a series of lakes above our campsite before heading back to civilisation, meaning our total trekking distance would be 20km for the day. As soon as camp was packed we trudged uphill for the last time, circling two large lakes that had bridged together, and scrambling over some sketchy boulders. The view back towards camp was sensational, but the final lake was by far the most impressive we had seen. Dead calm and protected from the wind, the stillness on the water transformed it into a mirror, reflecting the clouds and mountains with absolute clarity. Clambering back down from the last lake and past our campsite meant the final stretch towards Boz Uchuk. Our energy levels dwindled as we dropped closer to town. The scenery became less dramatic but more interesting as trees replaced high alpine grass and the rivers grew larger and more fierce. Murat and Nazira had opted not to go to the last lake, and when we came across them a few hours later they had prepared an ample meal for lunch. This couple were not only incredibly friendly and warm, but heroes in our eyes! Enjoying lunch with a view on our last day. Stomachs full we eventually hit a rough dirt road and followed it down to Boz Uchuk and our waiting transport. Seeing the van was bitter sweet. While our legs were burning and we couldn’t wait to have a hot shower, it was sad to be leaving the mountains that had been our home for 2 nights. The Jyrgalan trek was one of the most amazing experiences we accomplished in 2016. Knowing that we were among the very first tourists to ever see this fabled landscape was truly humbling. We can’t wait to hear how this region develops, and how hiking in Jyrgalan will help transform the community and benefit the enterprising locals there. No doubt there are big things on the horizon, and we can’t wait to return to see this first hand. As the Jyrgalan trek in Kyrgyzstan is still completely new, there is limited information out there about it. Luckily some enthusiastic operators in Karakol and the village of Jyrgalan are working hard on making this adventure more accessible to all travellers. Your first point of call should be to Tynchtykbek Zhanadylov (Tynch for short) and the team at the Jyrgalan DMO. Their new website has all the best tips you’d need about trekking in Jyrgalan, as well as information on how to organise it. It is absolutely possible to simply show up in Karakol or Jyrgalan and start making your plans from there. However it will help with logistics if you at least have an idea of what to expect. 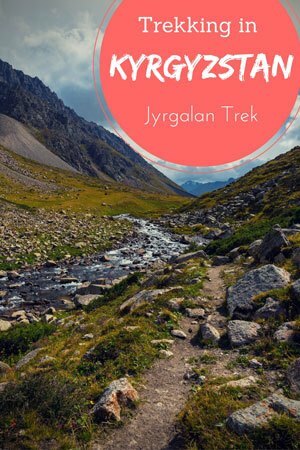 Here are some of our best tips and advice to help you organise your own Jyrgalan trek. During summer a marshrutka goes from Karakol to Jyrgalan three times a day. This is by far the most cost effective and convenient way to reach Jyrgalan. Once you have planned your trek Tynch will be able to organise the best way for you to get back to Karakol, depending on where you finish up. How Much Does The Jyrgalan Trek Cost? As this trek is still brand new and under development, exact costs are still being worked out. It really depends on how much support you are looking to take with you in terms of cooks and horsemen. For a general idea though expect to pay around $50 per person per day, including a guide, basic food, a cook, pack horse and horseman to carry your gear. This could fluctuate by $20 either way depending on your needs and whether you need to rent a tent and sleeping gear as well. In our opinion this is incredible value. With more people this cost can go down, but please keep in mind that having one cook for 10 people puts an unnecessary strain on them. Hire enough people to keep the workload manageable. How Many Days For Trekking In Jyrgalan? The trek we did was spread out over 3 days, 2 nights, but this can be personalised to whatever length of time you are interested in. For day hikes it is best to travel to Jyrgalan yourself and stay at one of the beautiful guesthouses in town. From there you can wander around the village and up into some of the nearby valleys. 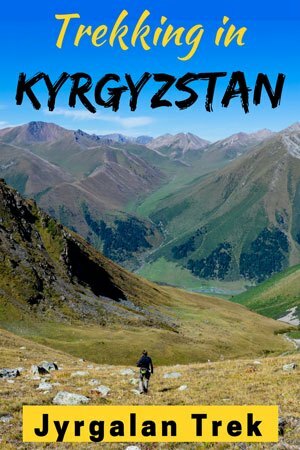 This also gives a great insight into local Kyrgyz life, and you could even consider spending a few days in the village before you begin your hike. However keep in mind there aren’t any trail markers or paths, so stay close to town and pay extra attention to where you go. Single overnight treks are also offered, which can be extended right up to 5 days depending on your fitness levels and time. Do I Really Need A Guide? Depends. If you are very experienced in trekking, have all your own equipment, are prepared for all kinds of conditions (it can snow in the mountains, even in the middle of summer) and can get your hands on a very detailed topographical map, then no, you might not need a guide. If this doesn’t sound like you, then yes, we recommend you get a guide for the Jyrgalan trek. As this is a newly opened area, there are no trails, no markers and no support. There is no phone reception at any point during the trek and help is a long way away. The only people you will come across will be shepherds and nomads, and even then that is not a guarantee. So we highly suggest that at the very least you get a licensed and experienced guide. Azamat and Jenish the horsemen, our guide Sacha and Tynch studying their map and notes, deciding on the best route to take. What About Pack Horses And Cooks? This one is totally up to you. Having pack horses to carry your gear is a luxury that can be greatly appreciated on the trail. Having all your camping gear, food and heavy clothing transported for you means you can travel light and really focus on the beautiful scenery around you (and of course snapping lots of photos). Being light also means you can take more detours and side trips to many of the gorgeous lakes that are tucked away off the main route. Hiring a cook again depends on your style and ability. If you are an experienced trekker and know your way around camp food then you can probably just do this yourself. But if you have a few people with you it works out to be very budget-friendly to have a cook there to put together some tasty and delicious meals as you go. To get the most enjoyment out of your trek, and if you don’t consider yourself to be an expert trekker, we recommend at least looking into getting a pack horse, horseman and cook to assist you on the trail. Talk to Tynch about these options. As little as possible. Packing light is one of the best pieces of advice we can give you. The long days hiking combined with the altitude can really take it out of you, so having less things to carry is paramount to having a great experience. The first thing to remember is that the weather can change drastically in the mountains. It can go from being t-shirt weather under a pounding sun to snowing in a matter of minutes. At night the temperatures can, and do as we experienced, drop to below freezing. So bring proper clothes that you can layer depending on conditions, as well as a waterproof jacket (and pants if you have them). Good hiking shoes are also necessary. Alesha and I completed the entire Jyrgalan trek in a pair of light running sneakers. While we did fine, it is not recommended, and a solid pair of waterproof boots would have made our time much safer and enjoyable. The second thing to remember is that you will be out in the elements the entire time, and there are no cabins to sleep in up in the mountains. Tents are required. Luckily these can be rented from EcoTrek in Karakol (along with sleeping bags, mats, backpacks and just about anything else you could need) for a very affordable price. If you are not hiring a cook you will need to bring all your own food. Pick this up in Karakol, as there are no shops in Jyrgalan. We also recommend bringing snacks to get you through the day. Fresh water can be found all throughout the mountains, but having a SteriPEN (our favourite item) or water sterilization tablets or drops is recommended due to the amount of animals that live up there in the summer. If you don’t travel with trekking gear this is not a problem, as you can rent almost everything from EcoTrek in Karakol, or pick up stuff in Bishkek. Lastly keep in mind that you will be out in nature. This means there is no power, no phone reception and no amenities. Bring spare batteries for your camera, or a power pack to charge things on the go. And lose the modesty and get ready to do your business out in the open. Standing at the top of the Terim Tor Bulak Pass. Due to the high altitude mountains and long, harsh winter, hiking accessibility to the Jyrgalan region is only ideal for 3 months of the year, from June 20 to September 20. During the summer you can find shepherds grazing their livestock and wildflowers blossoming. In autumn and spring there is still too much snow on the ground to navigate your way into the higher sections and over mountain passes. But this abundance of snow alludes to Jyrgalan’s other adventurous secret…..
Kyrgyzstan has been steadily gaining a reputation as the best up-and-coming ski destination on the planet. There are 3 main ski resorts in the country: Orlovka near Bishkek, Suusamyr in the Chui Valley, and Karakol, which is arguably the best ski resort in Kyrgyzstan. The title of Kyrgyzstan’s skiing Mecca could change hands soon with Jyrgalan village implementing some very exciting winter development plans. This includes creating backcountry ski routes, building chairlifts on some of the more premium slopes, and bringing in a snow cat to run trips into the mountains. That’s right – cat skiing in Kyrgyzstan! Jyrgalan will be the base for this winter wonderland. A winter-focused festival will be held on November 19th, 2016 to kickstart the plans. 2017 is going to prove to be a very progressive year for this small mountain village! When we visited Jyrgalan in August 2016 there were a couple of guesthouses under development, with the largest and most developed one being Alakol Jyrgalan Guesthouse (note: this Facebook page is for their guesthouse in Karakol, but it is part of the same business). Run by Emil and Gulmira, who are considered pioneers of tourism in the town, this amazing family-run business has private rooms, hot showers and even wifi. The other guesthouses in town were open for business, but still being renovated and improved at the time of our visit. The last we heard (October 2016) they were almost all open for business in time for the winter season. From June 2017 expect there to be quite a few options of where to stay in Jyrgalan, ranging from basic accommodation right through to modern, comfortable home stays. Prices will start at 500 Som per person ($7.50), and rise up to 1000 Som (US$15) per person, per night including breakfast. Camping will also be available. If you are interested in tackling the Jyrgalan trek yourself, or are just interested in visiting this off the beaten track destination in Kyrgyzstan, your best bet is to get in touch with Tynch in Karakol. He will be able to organise all activities for you. There is a website under development, and we will update this blog post as soon as it is ready. Our amazing group (minus Alesha taking the photo and plus Emil and Gulmira from the guesthouse) before our amazing Jyrgalan trek. We did the Jyrgalan trek with the help and support of Discover Kyrgyzstan. As usual all thoughts, opinions, kilometres hiked and nights spent shivering in a tent in the mountains are of course our own. We’re planning to do a ‘lite’ version of this trek in a couple of days, but just a word of caution about Eco Trek. We went in there today hoping to get some guidance on the Jyrgalan trek, and they said they couldn’t help us as all their guides were ‘up in the hills’. When we asked about hiring trekking poles, they had none available, and when we asked about the cost of transport to Jyrgalan village, they quoted us 3000 som ($60 NZD), which we thought was exorbitant. In short I was not impressed with this outfit, and we’ll be renting our gear from our own guesthouse. Hi Sue. Sorry to hear you had these problems with Eco Trek. You can now rent all your gear in Jyrgalan Village at Emil and Gulmira’s place. A marshrutka is 80 Som from the Karakol Bazaar, and a private taxi is 1300 Som. Drop into the Karakol DMO as well to ask for more info if you would like. They are great people in there and willing to help. It’s next to Fat Cat Cafe. I really cannot wait till the snow melts next spring and I can get back out to Jyrgalan to explore some more. Lovely write-up and photos, guys, and glad you always enjoy lil’ Kyrgyzstan so much! Thanks mate. I think Jarryd can’t wait to go to Kyrgyzstan when it is covered in snow. Jyrgalan is a stunning area. We can not wait to return to Kyrgyzstan> This country has a soft spot in our hearts.